A big Thank-You to RJ Cooper for lending me a Tooth Keyboard and Tablet Stand Combo and Big Blue Keyboard to demonstrate input equipment for the iPad at an upcoming OT’s with Apps Workshop (March 7-8th). Reviewing and comparing apps and equipment that support writing will be just one of the many topics covered at the workshop. Exploring how the Big Blue keyboard works and what apps it works with to support individuals needing writing supports brought about many questions about how it can be used to support those with motor challenges. Bluetooth keyboards, of course, come in all different sizes, however, most are either small or a standard keyboard size, making them difficult to access for individuals with poor motor control. 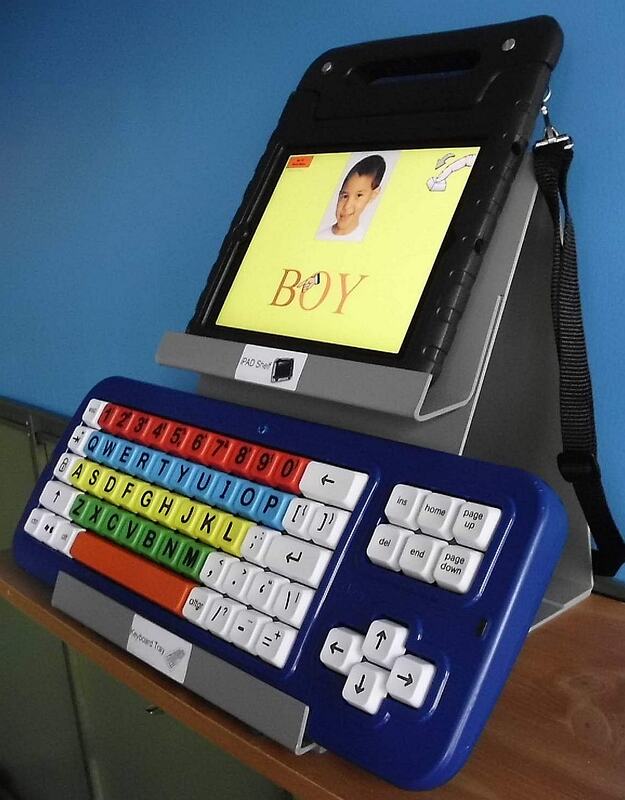 Using RJ’s Big Blue keyboard (Bluetooth) provides an alternative method of access to the keyboard, but brings a number of questions beyond keyboard input about other tools often needed to support writing can be used on the iPad. Such tools as word prediction, text to speech are often needed for more efficient input or writing support for many writers. How do those tools work with a Bluetooth keyboard to support written composition for individuals with motor and literacy challenges? Many of those answers were fortunately provided by RJ Cooper’s thorough instructions and tips about the use of the Big Blue keyboard with the iPad. Although I wanted to trial it with many of the word prediction programs to see which ones would work, RJ provided suggested apps trialed by him and methods of access (what a resourceful guy RJ is!). RJ’s instruction supplied information on the use of iOS Voice Over functions with the keyboard and specific apps that work well when needing word prediction, text to speech for written composing on the iPad. 3. When the Clevy Bluetooth Keyboard US is recognized. 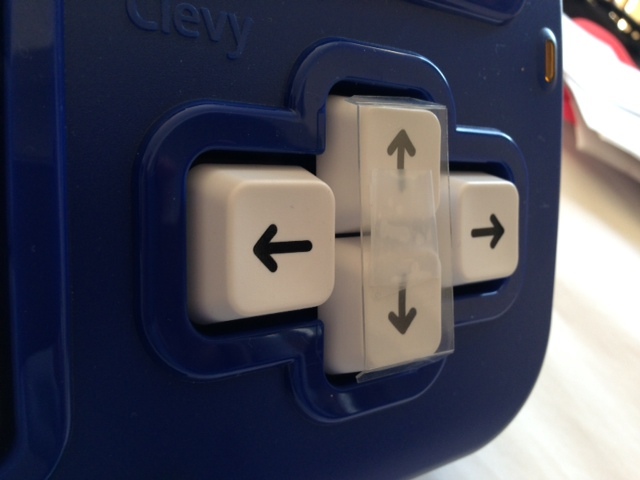 Tap on Clevy Keyboard in the Devices list to pair. 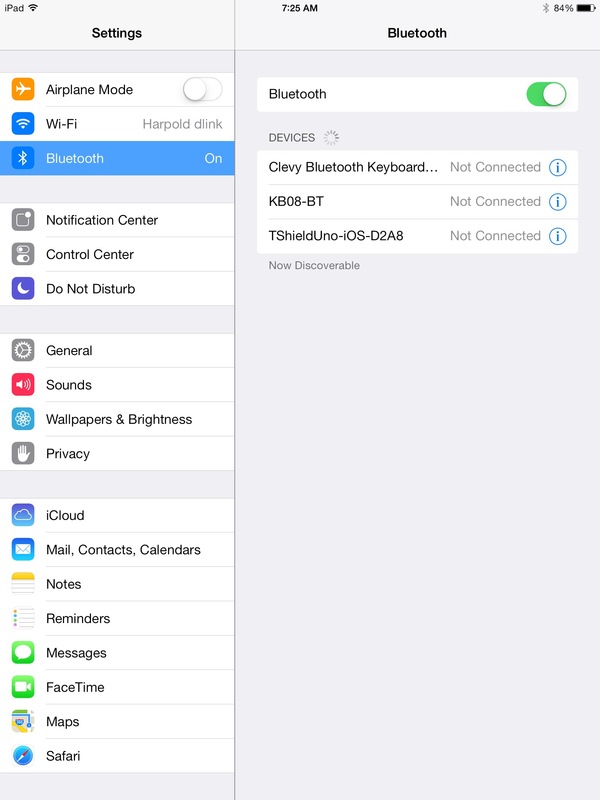 Pairing between the keyboard and iPad will require you to type in a code on the Big Blue. 4. 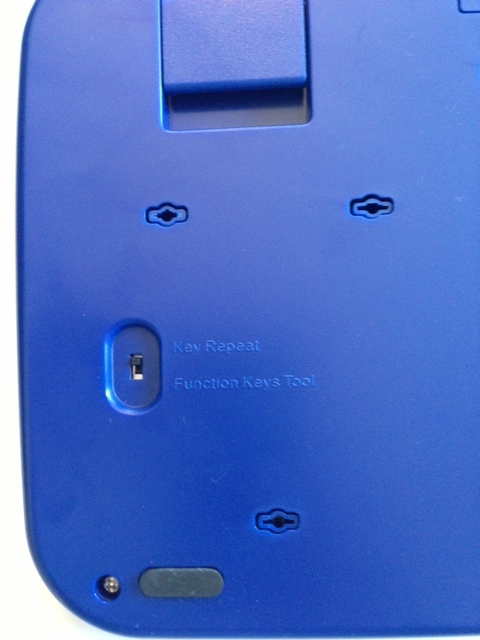 The Big Blue lights will flash indicating pairing and the keyboard will be ready to use. 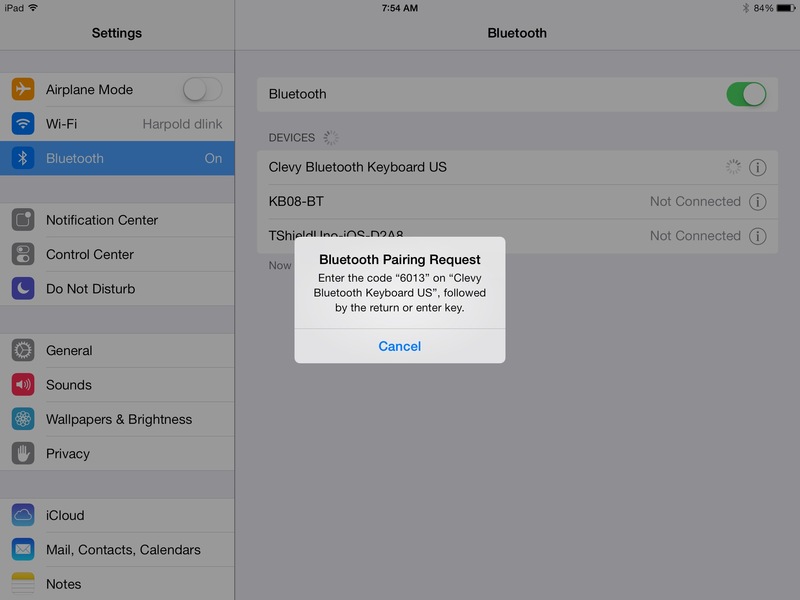 When using a Bluetooth keyboard the standard keyboard will not appear. The Big Blue provides easier physical access to a keyboard with its large keys and positioning as needed pending the users needs. What apps now provide word prediction, text to speech and selection for users needing writing supports? Keyboard shortcuts and function keys provide methods of selection when using a Windows or Mac computer but what will work on the iPad? Fortunately, as aforementioned, RJ provides instructions. This will allow VoiceOver to be easily turned on and off when the Home Button is clicked three times quickly at any time. 2. 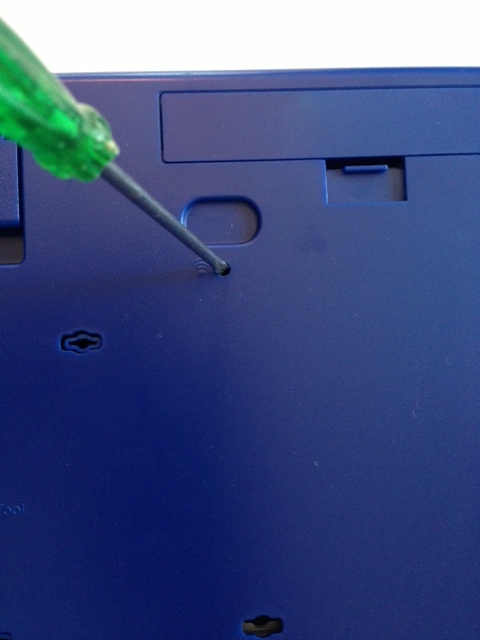 A Big Blue switch on the back of the keyboard must be turned on to Key Repeat. 3. With your keyboard and iPad paired. Open your selected word prediction app (WordQ is the app featured below). 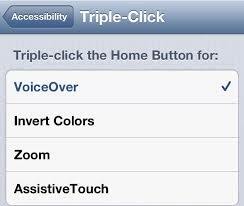 Prior to start of typing, triple click the Home Button to turn VoiceOver on. You will hear a message “VoiceOver is on”. 4. Using the right and left arrow keys (← , →) on Big Blue allows navigation within features of the app such as the text field area and word prediction list. 5. Selection of an item using VoiceOver can be made using the ↑, ↓ arrows simultaneously on the Big Blue keyboard allowing words from the prediction list entered into the document text field. Creating a quick cap affixed to the up and down arrow keys simplified activation using one finger or touch of both keys. 6. Additional control of navigation can be done using the altgr key which turns On/Off QuickNav allowing navigation within the text field or screen items. The keyboard keys can be used at any time to type, backspace, enter when word processing. Practice with navigation and selection of the word prediction took a bit of time to learn, but once familiar resulted in use of the keyboard to type and navigation basically within the app. Trial with word prediction apps found Brevity app, a basic app with word prediction, WordQ and AppWriter to work well with VoiceOver and RJ’s Big Blue keyboard. From my trials, I did not find success using CoWriter, TypoHD or iReadWrite apps with Big Blue and VoiceOver, however, I would never dismiss user error as a reason for lack of successful use! Abilipad, PantherWriter and Rocket Keys, nor Clicker apps were not trialed (that’s another day’s work!). What keyboards or apps for individuals with motor and literacy challenges have you successfully used? Please share! Interested in learning more about apps, iOS functions, keyboards and other equipment used in OT practice? Join OT’s with Apps for the School Based OT on March 7-8 for two days of apps for writing, reading, math, self-regulation, OT administration and hands on trials with a variety of iPad equipment. Hope to see you there! Again, a big thank you to RJ Cooper for loaning out his Keyboard-Tablet Combo Stand and Big Blue Keyboard! This entry was posted in Accessibility, Accessories, Apps for OT's, Apps for Special Needs, iPad, iPod/iPad Accessory, Keyboard, Mobile Device Use, Mobility Impairment, Occupational Therapy, Special Needs, Text to Speech, Word Prediction, Writing. Bookmark the permalink.